Palm Sunday introduces the beginning of what is commonly called "Holy Week" or "Passion Week" with praises and songs in honor of our Lord Jesus; although, this joyfulness soon turns to soberness in the solemn remembrance of Jesus Christ's persecution, beatings, and death upon the cross on Good Friday. Saturday brings with it anxious anticipation of what follows on Easter Sunday: celebrating Jesus' resurrection from the dead! "Now before the Feast of the Passover, Jesus knowing that His hour had come that He would depart out of this world to the Father, having loved His own who were in the world, He loved them to the end. During supper, the devil having already put into the heart of Judas Iscariot, the son of Simon, to betray Him, Jesus, knowing that the Father had given all things into His hands, and that He had come forth from God and was going back to God, got up from supper, and laid aside His garments; and taking a towel, He girded Himself. So when He had washed their feet, and taken His garments and reclined at the table again, He said to them, 'Do you know what I have done to you? You call Me Teacher and Lord; and you are right, for so I am. If I then, the Lord and the Teacher, washed your feet, you also ought to wash one another's feet. For I gave you an example that you also should do as I did to you. Truly, truly, I say to you, a slave is not greater than his master, nor is one who is sent greater than the one who sent him. If you know these things, you are blessed if you do them. I do not speak of all of you. I know the ones I have chosen; but it is that the Scripture may be fulfilled, 'he who eats my bread has lifted up his heel against Me.' From now on I am telling you before it comes to pass, so that when it does occur, you may believe that I am He. Truly, truly, I say to you, he who receives whomever I send receives Me; and he who receives Me receives Him who sent Me'" (John 13:1-20, NASB). The Gospel is inescapable. Read the Old Testament, and every thing that happens is a story of God's mysterious love and reconciliation. The Passover Lamb, Jesus Christ, is constantly "appearing" to God's chosen people during the time of the Old Covenant as their means of salvation from sin. The same happens here in John 13, just before His crucifixion and resurrection, where all the Law and the Prophets would be fulfilled by His sacrifice. Overwhelmingly, the message most often gleaned from John 13 is that we should follow Christ's example of servant-hood. 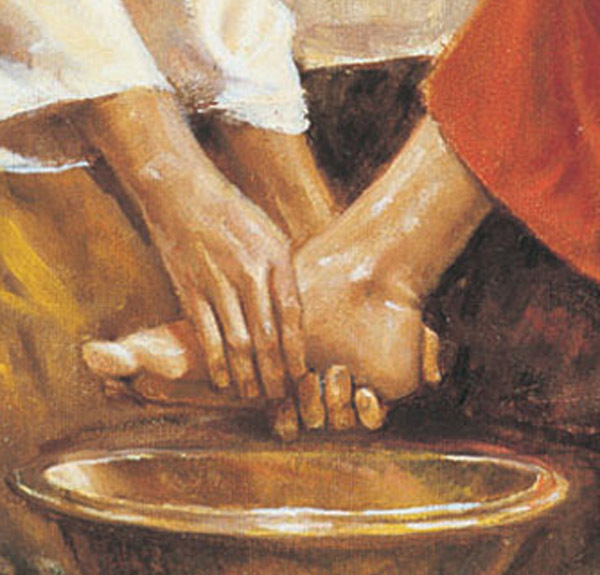 We are to serve other people just like Jesus did by washing His disciples' feet. However, I offer to you a deeper understanding of what is truly happening here. 1. Jesus Christ came to serve. Truthfully, Jesus said Himself that He came not to be served, but to serve (Matthew 20:28). Think about it: everything Jesus did was a service to humanity. He came for one purpose: to die for humanity as a sacrifice. He is the ultimate servant, yet He is also the ultimate authority (Philippians 2:5-11). Jesus served His disciples in John 13 in His life as well as in His death and resurrection. But how He served them goes far beyond washing dirt off their feet. 2. Peter didn't understand what was happening, but he would later. When Jesus comes to Peter to wash his feet, Peter objects and says to his Lord, "You will never wash my feet! You are my teacher and master; it is wrong that You do this for me. I should do this for myself." What Peter is essentially saying, though he does not know it, is that he should be the worker of his own salvation. "Don't do this for me. I must do it myself since I am too unclean for You." Peter is missing what Jesus is doing. He is washing him clean, as white as snow. Jesus says, "If I do not wash you, you have no part with Me." Jesus tells Peter, "Don't you see, Peter? You must be saved by My washing - through My blood - in order to be with Me! You can't do this yourself." Here is what Jesus is not saying: "This water is what saves you." Jesus is not saying that. He says, "If I do not wash you...." Jesus is the washer of sins. Not the water, not the physical blood, but Jesus Himself. Just as baptism is a symbol of new life with Christ, so this washing is also deeply symbolic of Jesus cleansing the believer. (Honestly, symbolic is too weak of a word for this picture, but it is the best I can do.) We must be washed by Him in order to be with Him, just as Peter had to be washed by Jesus in order to be with Him. Peter's pride almost got the best of him when he proclaimed that he did not want Jesus to wash him, just as ours does, but Jesus is clear when He says, "Unless I wash you, you have no part with Me." 3. After Jesus cleansed Peter, he does not need to be cleansed again, only refreshed. Peter said to Jesus after He washed his feet, "Then don't just wash my feet, but also my hands and my head too!" But Jesus responded by saying, "He who has bathed needs only to wash his feet, for he is already clean. Peter, don't you see? You are clean because I have washed you. There is no other Name under Heaven by which you must be saved. Therefore, Peter, you are saved. But there will come a time when you will need to be refreshed by the washing of your feet, such as I am doing now." Once again, Jesus is not saying that the physical water does this cleansing. What Jesus is talking about is spiritual. What Peter will need after this washing is refreshing and renewal, which comes through the Holy Spirit of God. This will make more sense in the next point. 4. Jesus told His disciples all these things so that they may be prepared for the Holy Spirit. When Jesus finishes, He asks His disciples, "Do you know what I just did for you?" Obviously they do not because He keeps explaining. "I am your Teacher and Lord. But just as I have washed your feet, so you need to wash one another's feet." Now, I have taken part in foot washing ceremonies before, and they have usually been quite powerful. However, once again, Jesus is not talking about physically washing one another's feet; He is talking about the Holy Spirit. That is exactly what Jesus is telling His disciples in John 13, though they do not yet understand it. "For I gave you an example that you also should do as I did to you. Truly, truly, I say to you, a slave is not greater than his master, nor is one who is sent greater than the one who sent him. If you know these things, you are blessed if you do them. I do not speak of all of you. I know the ones I have chosen; but it is that the Scripture may be fulfilled, 'he who eats my bread has lifted up his heel against Me.'" Jesus says that you are blessed if you do these things. What things? Blessing one another through the gifts the Spirit will give to you. How? By living according to the Word and Seed that I have deposited in you. Then, I will do the work through you so that My Church will be unified. This is where many believers have trouble. The Church cannot edify herself. The life-giving blood of the Church is Jesus Christ, her Husband. Everything must come from His authority downward. In our feminist age, it is often hard to see the right picture of marriage between a man and a woman, which, in turn, confuses our understanding of Jesus' marriage with His Church. Continuing, in the last part of the verses above, Jesus says that He is not speaking to every one of the disciples, for Judas Iscariot is not part of the chosen to whom He will give the Holy Spirit, nor is he part of them whom He has cleansed. But this was also for a purpose: that the Scriptures might be fulfilled. 5. Jesus promised that the Holy Spirit was unified with Him. "From now on I am telling you before it comes to pass, so that when it does occur, you may believe that I am He. Truly, truly, I say to you, he who receives whomever I send receives Me; and he who receives Me receives Him who sent Me.'" Jesus promises the Holy Spirit to His disciples though they do not yet understand it. When the Holy Spirit does come, and the Holy Spirit is at work among the body of Christ, Jesus says, "Truly, truly, anyone who receives My chosen ones also receives Me, and also Him who sent Me, who is God." Jesus gives us power through the Holy Spirit, not to be used for our own benefit or our own glory or even when we choose to use it; He gives us power to be used by Him, for Him, and when He chooses, for the unification of His Bride. Thus, when one accepts whomever Jesus sends, they also accept Jesus. Who can fully accept the one whom Jesus sends? Only the fellow believers or those whom God has also called to Himself. Wow! I am filled to the brim and even overflowing with joy as I write this! Isn't our God good? May the Spirit of the One, True, Living, Eternal God manifest His understanding of His Word to you today, that you and I may be called to repentance and understand the mystery of His Gospel. "Husbands, love your wives, just as Christ also loved the church and gave Himself up for her, so that He might sanctify her, having cleansed her by the washing of water with the word, that He might present to Himself the church in all her glory, having no spot or wrinkle or any such thing; but that she would be holy and blameless" (Ephesians 5:25-27).